Golden Rice is set to be launched on the market after over 10 years of research and development. If everything goes according to the product developers' plans, Golden Rice will be commercially cultivated starting in 2013. 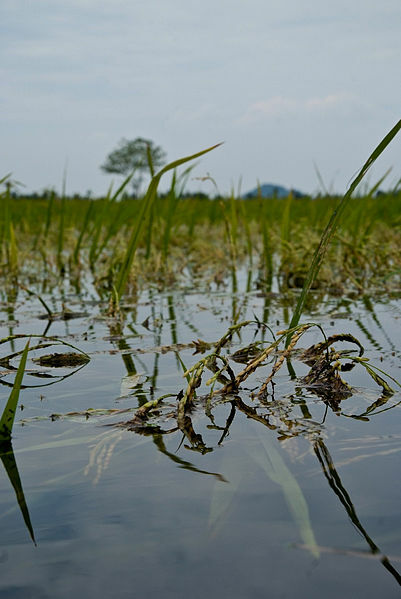 Advocates maintain that there is no alternative to this genetically engineered rice variety in the fight against vitamin A deficiency. No data has been made available on the degradation rate of its carotenoid content (in particular during storage), nor on its bioavailability. Any risks posed by the cultivation or consumption of Golden Rice have been largely ignored. Very little data is available on new active ingredients and changes in the metabolism of the plants, and on the reaction of the plants to changing environmental conditions. So far not a single feeding study on the rice has been published. In spite of all this, a trial has already been conducted on Chinese school children. It is highly likely that the commercial cultivation of Golden Rice will lead to the irreversible entry of this genetically engineered organism into the environment and to its crossbreeding with local rice varieties. It is not scientifically possible to predict the long-term ecological consequences. From the very beginning, the problem with the Golden Rice project was that its managers raised enormous expectations. There is no denying the fact that vitamin A deficiency needs urgently to be combated. New methods that could significantly alleviate the situation should be tested unconditionally. But the manner in which some parties are demanding the market release of Golden Rice arouses suspicions that the prime interest of the project's proponents is to accelerate the introduction of agricultural biotechnology. As regards essential transparency and due scientific diligence, the project has serious flaws that cannot be overlooked and that undermine its credibility. Furthermore, managers of the Golden Rice project demand a general easing of safety standards and testing requirements for the market approval of transgenic plants. To achieve this, they advance arguments that are obviously driven by partisan interests. This course of action is not consistent with the project's humanitarian approach, besides being scientifically and ethically unacceptable. To avert damage to their own credibility, the institutions that sponsor the Golden Rice project, such as the Rockefeller Foundation and the Bill & Melinda Gates Foundation, should clearly and unequivocally distance themselves from the argumentative strategies described in this paper. They should take decisive action to ensure that thorough risk assessment is carried out, missing technical data is published as soon as possible, and that an open debate is no longer avoided regarding the short-term, medium-term and long-term risks of the project. They should also reappraise whether it would not make more sense to invest the money in already existing programs to combat vitamin A deficiency. Since the Golden Rice idea was first presented, other internationally recognized programs have achieved considerable progress in alleviating vitamin A deficiency. These programs will continue to be essential in the future in solving problems locally. In contrast, the long-term problems posed by Golden Rice could turn out to be much greater than any benefits. We call on the managers and funders of the project to ensure that comprehensive and independent risk assessment studies be conducted, and to publish the technical data that to this day remains unavailable. The managers of the project should finally agree to participate in an open discussion on risks posed by the Golden Rice project. Available alternatives should be examined more carefully before the project proceeds any further. Various reports refer to the significant progress that has been made in the fight against vitamin A deficiency in developing countries over the past 10 years. Efficient and low-cost programs that enjoy and offer a high degree of acceptance and reliability, and that can also be very precisely implemented, do exist. In view of this, the scheduled market release of Golden Rice is by no means without an alternative.